Over the weekend I trekked down to the Hirshhorn museum to meet the inestimable Ms. Thorson (Esq.) and prowl the new "Refract, Reflect, Project" exhibit of light installations. The show was a mix: a few stunners, a lot of day-glo conversation fodder, a few that were particularly dated or flat. My favorite was Olafur Eliasson's "Round Rainbow" (shown right), which is a large, rotating, ring prism that creates an incredible evolving pattern in an otherwise bare room. Another one I liked was James Turrell's "Milk Run"--again, an immersive piece, so dark that your eyes have to adjust before you can see the gently glowing geometries of blue and yellow. Maureen compared it to being inside a refridgerator as someone cracks the door...this was after she mistakenly tried to walk right up and into the piece, causing a security guard to intervene. The project was partly the result of wanting to make a simple form visible: 'The simplest forms have authority, like a blank white light. And how do you photograph that? You need a framework to make it visible. But this is not simply white light; it is the result of too much information.'" I loved this show. 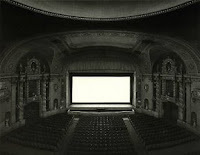 Sugimoto's work is notable for its composition and its luminosity. He has a series of seascapes in which all chronistic references, such as ships or coastline buildings, are cropped from the horizon. What remains is an equilibrium of water and sky, distinguishable from each other only by the faintest striation of waves and clouds. The installation itself was very sophisticated: a darkened room in which only the Iris prints were lit, and they managed to do a spotlight projection that hugged each rectangular piece. 9 or so of the seascapes, from all different locales, were hung on a gently curving wall. A series of benches invited quiet contemplation. If I were not an editor, I would try to work in a museum. Washington is filled with niches of art--the Rothko room at the Phillips, the atrium of Calder mobiles at the National Gallery, the Monet room at the Kreeger--that provide me a greater (and quieter) joy than pretty much anything else. My mother's an artist; my flatmate's an artist. It's where my gravity lies. I'll be offline for the next few days; as a general rule, I don't lug my laptop to AWP. A full report when I return...within the past week or so I've received notice of poems accepted by both Coconut and Pebble Lake Review, so there is much to celebrate in Atlanta! You can force me to sign up, but you can't make me label myself. About a month ago I received a chapbook from a local author, Alan King, and I've finally had a chance to read it over. His collection is called Transfer, referring to both the literal bus pass and the larger transitional mode, and a majority of these poems--with titles like "ritual" and "template"--are concerned with social flux. Specifically, how do we define our relationship patterns? And then, how do those patterns begin to define us? The contexts vary from the romantic to the political to the neighborhood; the speaker definitely has a DC voice, and it's satisfying to see casual references to local fixtures like Ben's Chili Bowl or Tryst. ...who tryna see the doctor first? There is rich music here--"cowries / hanging off cornrows"--and it is refreshingly unforced, as is the humor of their dialogue. These vignettes of local life really came alive to me. In some other poems the use of language feels a little overly formal or self-consciously arty: ""her mouth, a sumptuous oval split / into horizontal hemispheres // testosterones lead an air strike on / my cerebrum...." But overall this is a collection of great promise, and I look forward to seeing more of King's poems in print. 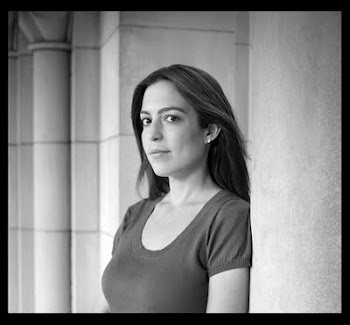 Speaking of anticipation: I can't wait to come home from Atlanta with books--lots and lots of books--and having put faces to names I've been reading in books (and on blogs) for the past year. I'm not tabling anywhere, so just look for me hanging around the Hilton. I'll be the one with a flask of scotch. Runner-up honors to Sleeping Beauty, The Constant Gardner, and (most recently) Pan's Labyrinth. Please note that I didn't think about objective issues of cultural significance; I just picked movies that I love. In no particular order. I could put less fantasy on the list, but I'd be lying. Maybe if I'm lucky, I can coax Angela and Bernie and Don into answering this question. While I'm spreading the media gospel, I should mention Josh Ritter and his new(ish) album, The Animal Years. He's got some nice live performances floating around on YouTube, particularly a whole set at Easy Street Records in Seattle. I recommend "Girl in the War" and "Idaho." Yeah, that's right, I'm quoting lyrics at you. I will soon regress into the teeny-bopper abyss of reporting on an interview with Johnny Depp in the latest issue of SASSY magazine, and pondering the latest bangle styles at Claire's. Last night, I woke up at 4. I woke up at 5. I woke up at 6:08. Each time, the sound of ice beating against the windows of my bedroom. I couldn't sleep. I wasn't hungry, and I wasn't (that) cold, and if there had been nightmares I couldn't recall them. What was it? Why was the phrase "small kingdom" bouncing about in my head? Why was I picturing the many types and colors of basil, and my mother's hands as she cut the rosemary bush down to twigs? Why was I logging on Wikipedia to read about seasnails and chambered shells, when the sun hadn't even come up yet? And then I realized...I was ready to write. And damn, it's been so long I'd almost forgotten what it felt like, the restlessness of it. The willing absorption of it. So here's to falling in love again--even if it's just an affair with your own work, on a very slushy morning in a very dreary city. UPDATE: Reb was kind enough to point out that this little article is getting around! Even Mr. Silliman took a look. My article on Burlesque Poetry Hour just came out in the February issue of DC North (one of those freebie mags you see in boxes by the metro), published by Capital Community News. According to the editors, BPH = Strip Poetry = Valentine's Day theme. Who knew? I'm pretty happy with the article--though I'm going to have to term it "participatory journalism," since the alternative is "reporting with blatant bias." And no, I didn't know that my torso was going to make a cameo appearance in the layout. Find the text here. / See the pretty version here (PDF, about 1.5 MB). 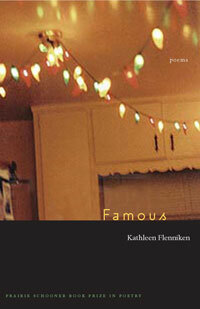 I've been excited about the work of Kathleen Flenniken as of late, and just ordered my copy of Famous. I love the cover art--it reminds me of a Diane Arbus photo that shows a family's neat, empty, living room at Christmastime (oddly permeated with disturbance, like all her compositions). If I had the money and leverage, I would love to use an Arbus photo for a book cover. Or artwork by Joseph Cornell. Or Ross Bleckner. Hmmm. I may need to acquire more money. next to the whale bones and amethyst geodes. handled with gloves, exquisitely fragile. Isn’t it funny they’ll never connect us? This rock woman with that paper man? They were never in love. She would have pounded him into dust. He’d have been crushed by a woman like that. It makes me very happy to have my work mentioned here. Such good company! Has anyone out there used the Princeton Encyclopedia of Poetics recently, as a student or teacher? The editors are working on the fourth edition (revisiting all 1700 entries! ), and looking for suggestions for improvement or notice of things that are lacking. Please leave feedback in the comments box, and I'll pass it along.